I spoke to the printer of my verse memoir “Mick, Jane and Me – Living Well With MS” today. He had just begun getting ready to begin the print run. Later in the day he sent me pictures of the first 8 copies of my book. He gave me a time line and it certainly looks like this is going to work as it’s planned. The printing gets done today, the book is sent off to be perfect bound Monday, it goes back to the printer Tuesday and then on to the MS Society SA & NT. So it will be available from the MS Society for me to pick up in time to take it to the Tea Tree Gully library to launch the book to all of the people waiting to get their own copy. My stress levels have eased, and my excitement level is rising rapidly! Today I was the guest poet at the Gawler Poets at the Pub. I read from my manuscript and the audience seemed to enjoy my words. Some of them are hoping to get to my launch, and if they can’t make it, they’ve said they’d like to get their copy at the September Gawler Poets at the Pub. This is looking great and I’m so glad I wrote this book. I hope it will be there to help people newly diagnosed with MS, and also useful to give to family and friends of people with MS. There are so many stupid things being said about this chronic illness, so many things that are only half true, or true only for some. There are also many things said that are not true at all. This has been an interesting journey, and I’m so happy to be travelling this road! I visited an interesting website today, one which can help writers to write. It does a word count of text you write, and gives you a reward for every 100 words you write. I thought I’d give it a go, and produced the following. “One day the world will recover from this destructively evil kitten obsession. 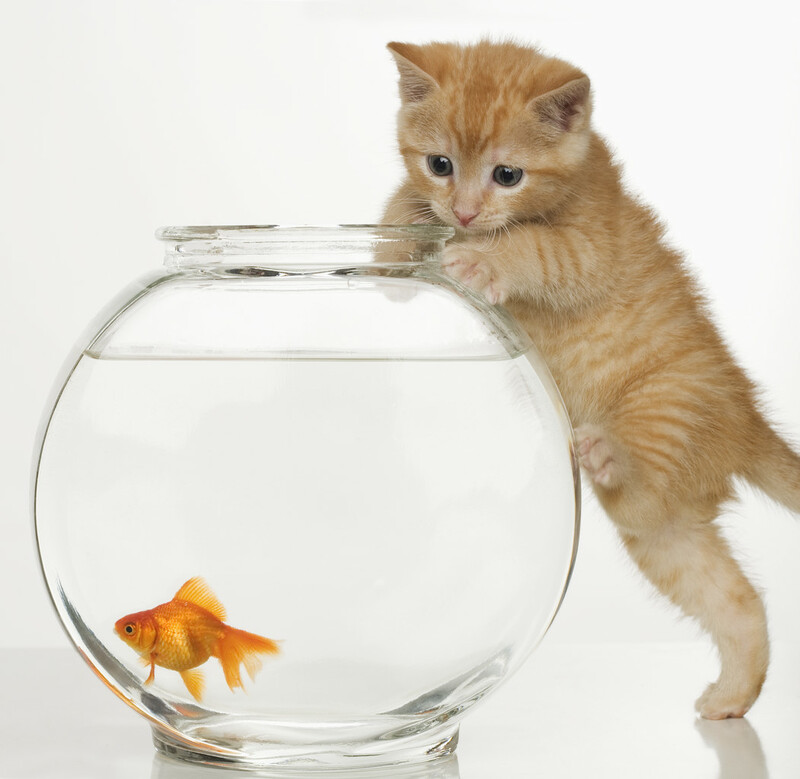 Kittens, though cute, will eventually grow into cats. Today I went to the Mallala Museum, with some others from my writing group. I parked my car close to the museum, and a hundred yards or so from the Mallala Hotel. I wandered around the museum with the others, looking at the great historical things on display, and marvelling at the work the volunteers have put into improvements. 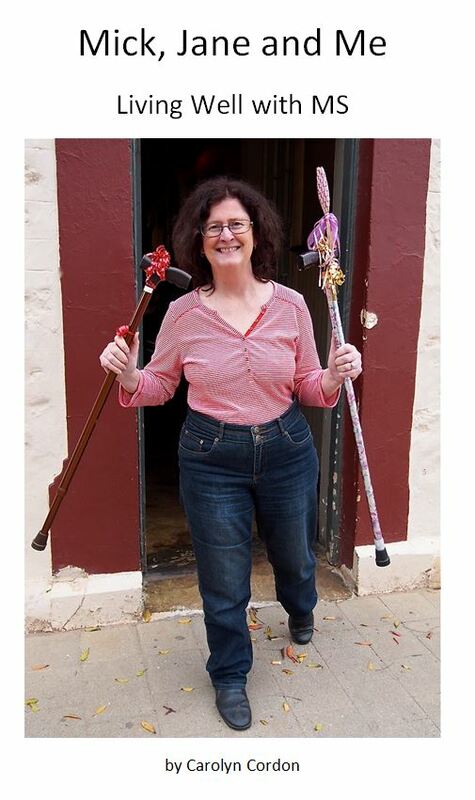 When I go out in my own car, I have both Mick the Stick and Jane the Cane with me, just in case I need one of them. They are both still decorated from their photo shoot for the front cover on my memoir. This means Jane isn’t as usable as a walking cane as she should be. 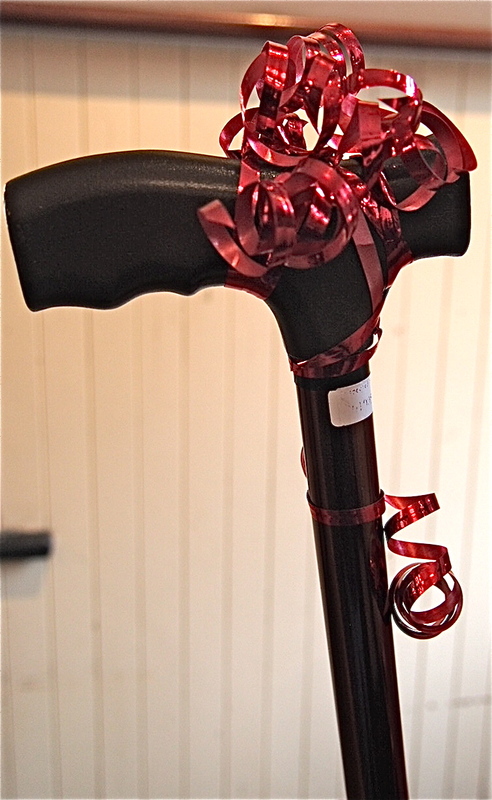 Mick the Stick is still usable as a walking stick, and quite attractive with his snazzy red curling ribbon. When we had finished at the museum, I decided to walk over to the hotel, where we were all going to have lunch. I decided to walk over there, rather than drive my car, and then walk back again after lunch. The way as the crow flies is not the same as the way by road in the car – private vehicles aren’t to go the way a pedestrian or emergency vehicle can go. Anyway, Mick and I went for our first walk in public with him in his decorated state, to the hotel and back again after. I felt safer having him there with me just in case. Thinking about the walking stick issue, to take or not to take, led to a discussion during lunch about public transport and government assistance to disable people. These issues are rarely considered, I feel, by able-bodied people. Why should they bother to think about these issues if they don’t affect them. I know in my previous life, as a well abled person, rather than a disabled person, I wouldn’t have thought about them. Now though, I have a much greater understanding of the challenges disabled people have in life. Even going for a simple walk leads to consideration about whether or not to take a mobility aid. The life of a disabled person is certainly more difficult than that of the able bodied. I hope others can consider these issues, and put themselves in our shoes sometimes. It will help them to better understand these things, and stop taking things for granted to readily. Seats are important, rest breaks are important. The name for this blog comes from my two main interests in life, gardens and dogs. It also relates to this book in the photo here. The book is the first of my self-published books. It’s a funny little book looking at gardening from a dog’s point of view, called “Dig It! Gardening Tips for Dogs”. It has illustrations done from a friend of mine, Allyson Hean. I’ve known many dogs in my life, and I’ve paid careful attention to the way they enjoy themselves in the garden. I hoped this little book could offer something good to people trying to enjoy both their garden and their dog. The two don’t always go together happily! In our household currently, we have Lah Dee, a male pharaoh hound from our first litter of that breed. He is fun to live with, but for his obsession. This obsession is with hole digging. He’s allowed to dig holes in the dog run. He isn’t allowed to dig holes in the lawn. He doesn’t understand this, obviously. If we leave Lah Dee out in the back yard for too long, he will almost always dog up the hole he’s already dug and we’ve refilled many times. We also have to sweep the dirt he’s dug up from the veranda. That’s the way of it. So if we don’t have to do that, Lah Dee is either shut down in the dog run area, or let inside with us. The other dogs we have don’t dig up the lawn the way Lah Dee does. Their main activities in the back yard involve eating things – insects, animals, birds … anything they consider to be food. Well, that’s the other two pharaoh hounds, the girls, Ananka (Lah Dee’s mother) and Missy (Lah Dee’s sister from a different litter). Nena, the schnauzer is a good girl and rarely does anything we don’t want her to do. The words in the book as as written by a made up dog – Buster. Buster is the dog in the book. He is what you would get if you crossed the two dog breeds I am involved with – the pharaoh hound and the schnauzer. The dog is tall and slim, with a short coat and a whispy beard. One of our dogs, from many years ago, Ming, was interested in bonsai, which is one of the things I like in the garden – these tiny trees fascinate me at times. I have a few bonsai trees, and care for them as you must if you have them. Bonsai trees in proper bonsai pots need careful watering and trimming, and also wiring of their branches to attain certain effects. Ming didn’t care about that though, she was more interested in freeing the bonsai trees from their pots – not a good idea! Anyway, this little book came out many years ago, and every now and then I wonder if it may be time for another print run. That time has come around again – should I put the money into it again or not? Your thoughts most welcome on this one! Spring is in the air where I live. The nights are still cold, but when the sun comes out during the day, it’s wonderful. 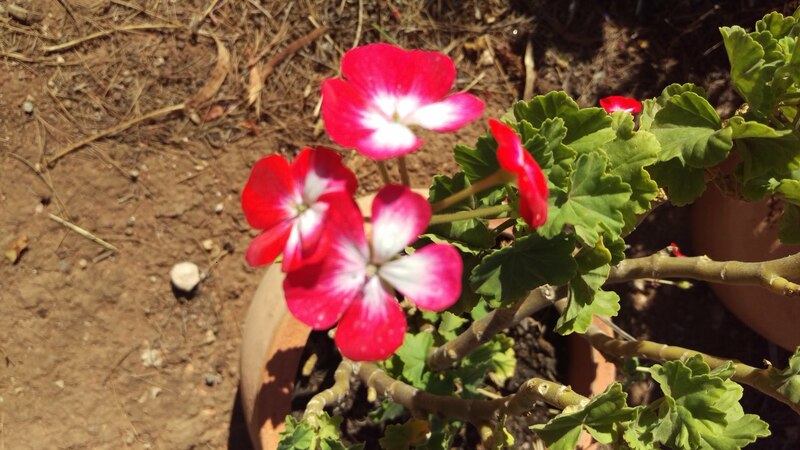 The plants are growing, with beautiful flowers coming around the place. I am so over the winter chill! We have various flowering plants around the place. Some in hanging baskets, some in pots and some growing in the ground. There are native plants and others, some with pink blooms, some yellow, some red. I love them all. I love our big imposing trees too. We have pine trees, gum trees, peppercorn trees and others. I am so glad we live on a big enough property to be able to have many tall trees, and assorted smaller trees, bushes and other growing things. 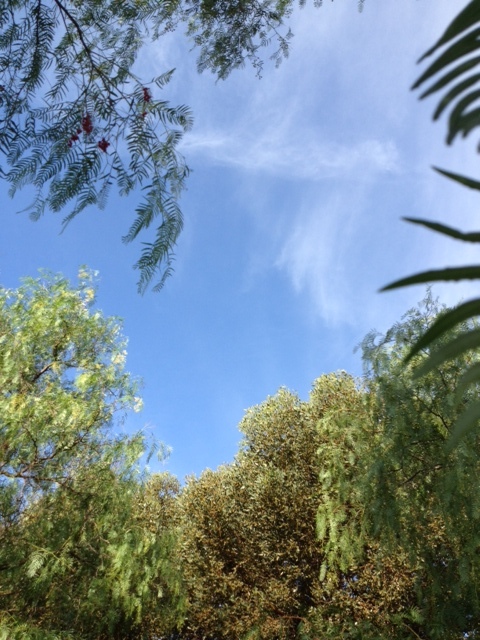 I feel so sorry for those who can’t have big trees of their own to look at every day if they wish to. I think Nature is my god, and being outside, or being able to see outside, is my church where I worship the miracle of growth and change. seeds grow into trees, trees go through the seasons, growing, slowing down, blooming, dying. And then new plants grow.